Offering excellent braking and cornering safety, the Conti Sport Contact 2 is a superior performance tyre ideal for dynamic drivers. 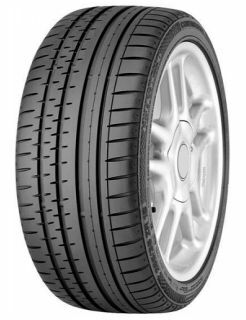 Designed with an innovative asymmetrical tread design, the Conti Sport Contact 2 guarantees maximum adhesion to the surface of the road, this results in superior levels of grip and an extremely precise steering response. This tyre also offers shorter braking distances on both wet and dry surfaces thanks to its bionic contour which achieves a more uniform ground pressure distribution.